It encapsulates what remains to be done from the time this news post has been drafted! The red bit (initially 10%) is a couple of things that VALVe broke and we're kind of waiting for them to fix. Things like the Steam overlay and game launch options not working or the fact that you can only play the game in English right now. It's a real bummer but if push comes to shove we'll release without those fixes. The orange bit represents our release infrastructure and game servers for you to play on. The rest is related to the game itself. While all this is happening we're also planning on releasing regular updates with detailed information about the game to get you ready for playing. Expect more on game play, maps, game modes, weapons and so on. Thanks for hanging in - we can't wait to play with you! Valve got back to us saying they won't implement the fix because they've dropped support for Source SDK Base 2007. That means we're porting to "2013" - and we've already started. As you all know, the release of our game is imminent - or it should be. Our goal was to have you lot already playing by now. A lot more work is going into this release these days than we had anticipated. We are working hard and we're not quite done yet. In late December we were blessed by a new addition to the team - a skilled animation artists who was able to bring our new weapons in-game. This is not the main reason for the delay but most of the old weapons had to be replaced before the release because of the lack of quality and some being of unknown origin or Valve-content which we are not allowed to publish. Similar things happened with our (new) Tau'ri player model. These things tend to bleed into other areas of the game: code needs to change, dependencies need to be tracked, everything needs to be tested. This in turn distracts from other important things that need to be done and the whole thing gets delayed. A map gets recompiled with a small error by mistake, the source of the error needs to be tracked down and the whole thing starts over. 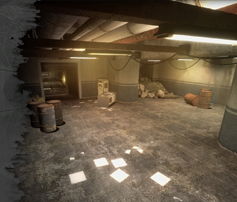 Before we continue the story we'd like to offer you a small glimpse into what awaits you once you get your hands on the game. On the About page we've added two new links: One leads to our work-in-progress Game Manual and the other to a list of Known Issues and Planned Features. A small consolation prize for not being able to play yet perhaps and you can start asking questions if anything is unclear and we can improve those pages. Moving on... all the new content that was added over the last weeks sadly has made issue number one on our known issues list even worse and more crazy stuff started happening. We're trying to contact Valve about it but perhaps we need to port to a newer version of the Source Engine which would cost more time. We're exploring multiple options at the moment but we're not very happy with the current situation to put it politely. And please remember we're also just doing this in our spare time . Anyways, that's just some of what's currently going on behind the scenes and we're very sorry you can't play The STARGATE Mod yet. For quite a long while now we've been keeping track of the game's development internally with various tools, custom made and third-party. This helps ease our workflow immensely. The time one might require to keep other team members up-to-date with progress reports and vice-versa can be put into actual development. Files are neatly managed and version controlled, issues and future plans can be treated and drafted easily. This allows us to not just road-map the future, but also the past. Earlier this month we decided to share some of this past with you. When browsing our Home page you will notice a new info bar right between the updates and the big news articles. 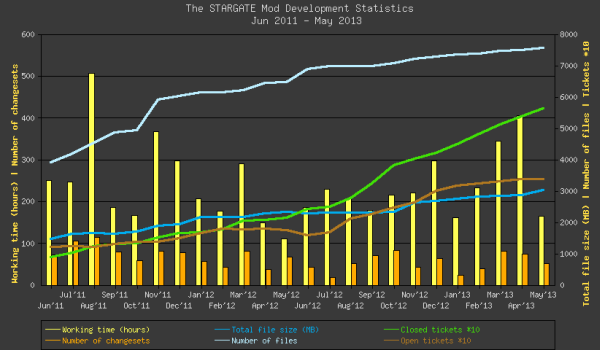 This dev-stats bar gives a quick overview of our development over the last 30 days. If you click on the more statistics link to the right you will get a more detailed view including numbers from over the course of the last week (7 days) as well as a graph going back about two years. Every team member can log what they're working on and when they're doing it. This shows the cumulative logged hours of the given month. A changeset in this case is basically an update to the game. Whenever someone updates, adds or removes one or more files in our internal beta it constitutes a changeset. Game patches or versions if you will. This should be pretty self-explanatory. They display the size of our internal beta version of the game. As this includes test files and some other things that may not make it into the initial public release, expect these to drop for the open beta. Tickets in their simplest form can be thought of as bug reports. Most of them are, but close to half are actually feature requests and other things that need to be done. The closed state indicates that the issue has been taken care of (being resolved or rejected) whereas the open state signals anything from debatable and non-confirmed through accepted to in progress. Note that for the purpose of this graph the values have been multiplied by 10 for stronger visibility. So no, at the time of writing there are 330 open tickets rather than 3300. Lucky us. All of these development statistics are refreshed each day. We hope you enjoy this bit of insight into our making of this game and appreciate to be able to see how actively we're working on it at any time.